Ayu & Gilles, for A.G. Bali Export. Ayu, makes you enjoy here shopping and logistics experiences in indonesia. Before creating AG Bali Export, Ayu started by working at an international freight Cargo in Bali, while Gilles bought furnitures and decorative items in Bali and Java to export in France in his own stores. So naturally Ayu decided to create AG Bali Export. AG Bali Export, is an Indonesian company with 12 years of existence and experience in research and product development, sourcing, purchasing and shipping from Bali and throughout Indonesia. Ayu’s customers include hotels or restaurants owners, furnitures and decorative objects stores , developers, but also many private customers for Villa. With AG Bali Export, your purchases are in good hands. During all this time, Bali Export AG has developed a network of suppliers and partners in Bali and throughout Indonesia, to meet almost all requests. 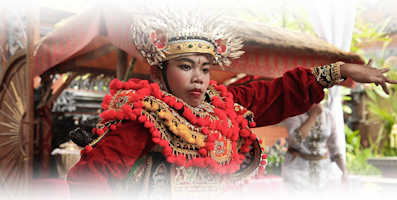 AG Bali Export is your trusted partner for all your export project from Bali, Java and elsewhere in Indonesia. The main motivations of any buyer in Indonesia are, to be able to order their own customized products, and also have a wide selection of products from low to high range, and of course make a good deal ! The strength of Indonesia is the wide variety of products : you will find an incredible choice of indoor furnitures, modern outdoor furnitures, teak garden furnitures, synthetic rattan, stainless steel products, decoration objects, natural decorative roots, varied lighting, garden huts (Gazebos), wall cladding stone to whole house prefabricated exotic wood… PLease visit the Products section of our website. What are the suppliers i can trust in , there are so many ? Is the quality of the products i ordered will be identical to what I saw in the showroom ? Is the seller understood my request and my expectations, despite the ten “yes” he served me? Who will receive the goods, then check the quality, and supervise the packing and shipping. Because I will already back home when the orders finish ! Did i really paid the right price ? Finally our role is to save you money. After identifying your wishes , we will bring you directly to the right suppliers , manufacturers or stores, so you can choose your models. You, the provider , and we, take the time all together to elaborate your order. The price is negotiated at that time. As we continually buy in Indonesia , we know the good prices,keep us from long discussions , and the risk that the supplier make a bad job to make up is profit, for lost when trading. Once all orders made ​​, you can enjoy the beautiful beaches of Bali, because we take care of everything else, until the delivery of the container at your country.